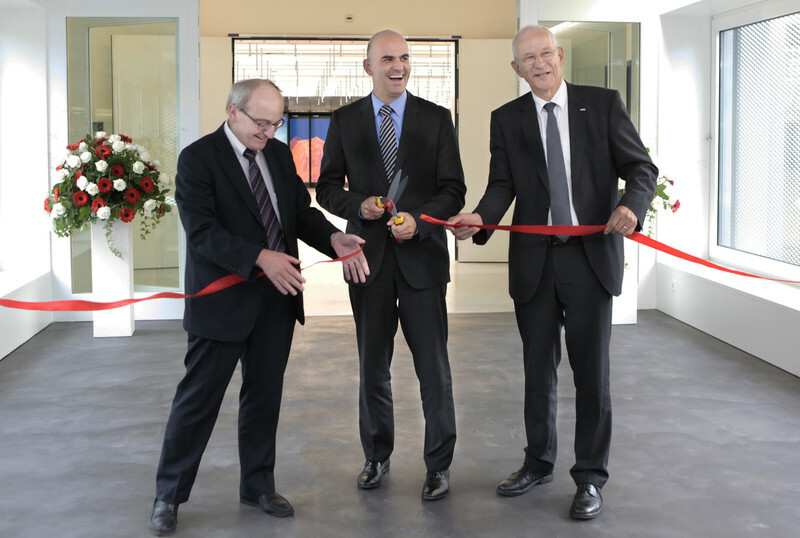 The new building for Switzerland’s national supercomputing centre (CSCS) has been inaugurated 31 August 2012 by Federal Councillor Alain Berset. The construction of the new building was made possible thanks to the national supercomputing and networking strategy. High-performance-computing has become a key element in securing scientific competitiveness. Demand for compute power from scientists continues to grow. Today simulation is an established pillar of scientific method alongside theory and experiment. Inauguration of the new building: cut of the ribbon. From left to right: Fritz Schiesser, Alain Berset, Ralph Eichler.